Roast potatoes are pretty much a staple in our house. If you are using the oven and you need a starch to go with your dinner, what is the easiest option? 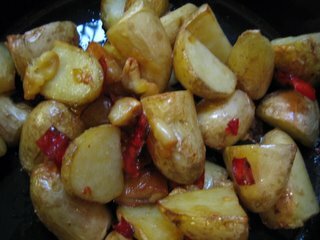 Roast potatoes. They can be decadent or trim. Simple or special. Peeled or not. New or old. If you are having a traditional English Roast for lunch then traditional roast potatoes are order of the day. If you are having confit of duck then roast the potatoes in some of the duck fat. If you are feeling healthy then all you need is a light spray of olive oil. If you are having Thai style rack of lamb then make the roast potatoes with garlic and chilli. There were gorgeous new Jersey Benne potatoes in the cupboard so there was no need to reach for the peeler ; leave them with the skins intact. The box of Bennes was a mixture of tiny and slightly larger than tiny. I love the tiny ones plain boiled with butter and salt, or cooled off in a vinaigrette bath. I chose the larger ones for the roast potatoes, scrubbing the dirt off and cutting them into quarters. It is so gratifying to take the dirt off vegetables yourself. I peeled some cloves of garlic, chopped a chilli roughly and tossed the potatoes, chilli and garlic in a spot of olive oil to coat and a sprinkling of salt. They roasted for half an hour at 190ºC with frequent tossing.